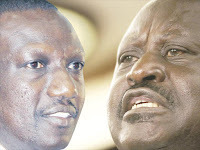 Thursday April 11, 2019-Orange Democratic Movement (ODM) has told President Uhuru Kenyatta to be careful with his deputy William Ruto because he is scheming on how to tame him and Kikuyu community. In a statement on Wednesday, ODM Secretary General, Edwin Sifuna, said Ruto has been approaching senior leaders in the country with an aim of helping him tame Uhuru and his people. "Ruto is the face of blackmail in high places. He has specialised in blackmailing Kikuyu masses living in the Rift Valley, to gain a way to the Presidency. He attempted to sell the narrative of ‘finishing our common enemy’ to Raila, who declined the offer. Now he wants to blackmail both Raila and the President at the same time! "Sifuna said. But in a fast response Ruto through his spokesman David Mugonyi dismissed Sifuna's statement as personal. "The incoherent, rabid juvenile rant by Sifuna is [so] ridiculously uneducated, spectacularly unhinged, desperately delusional that out of our compassion, it must be forgiven and ignored. "We don't believe that ODM, even in its current dire straits, has fallen this low," Mugonyi said.